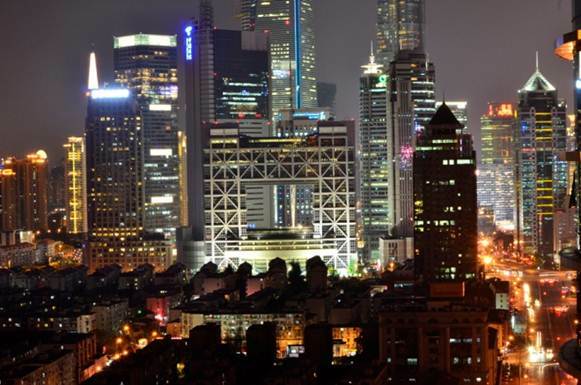 Staying at an airbnb, the ”lujiazui riverview room shanghai” in the New Pudong section of Shanghai with spectacular views; for example, Shanghai World Financial Center – the tall one in front, 101 stories – I went to the top, above the hanger part, on a previous trip alone because Narda doesn’t like heights. 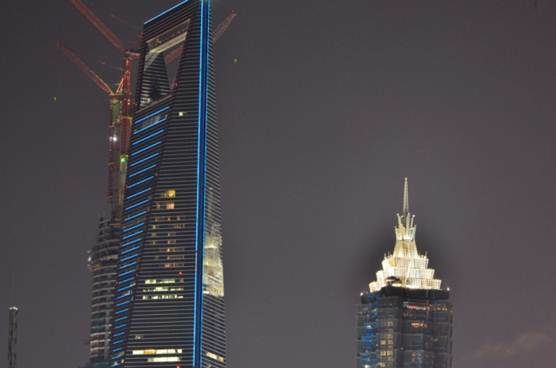 Behind it is the Shanghai Tower being built to go to 125 stories 2,073.87 feet when all is said and done. Where we are staying looking at this we are only on the 29th floor so that seems safe. 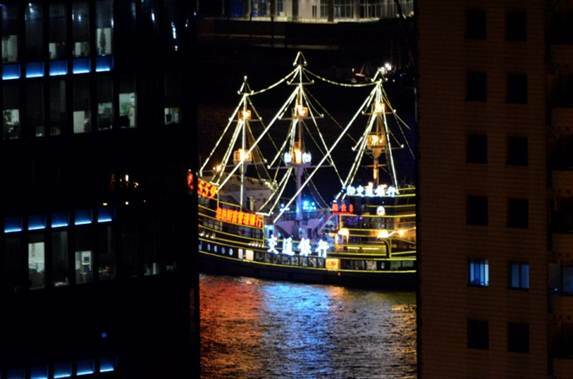 View from our 29th floor balcony, looking out on the Huangpu River – which Narda was nervous about me being out on. We have an office view blocking part of view and I was hoping to spy in on someone at work but in the three days we were there not too many people were at work when we were at home. I took some hundred photos and heaps during the day too but it is the night views that I liked. This is basically the view from lying in bed. We had our apartment near the Pudong Avenue Station, Subway Line 4, a 4-minute walk up to the subway station. It is about equal to the ferry across the Mississippi in New Orleans. 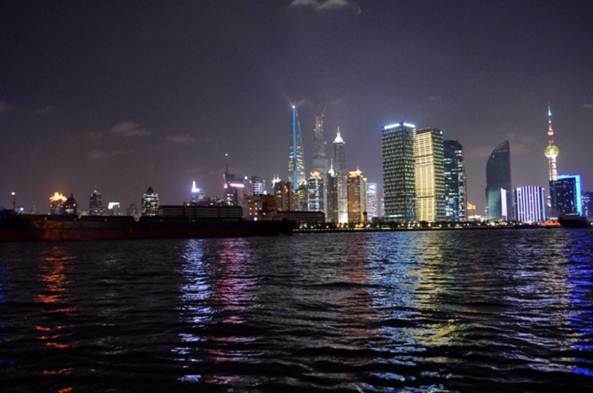 The views, hanging out of the side of the boat of Shanghai was well worth the ride. There is nothing on the other side of the river at the arrival point except for fifty scooters roaring off and up an unlit roads so we shelled out another two RMB and rode back home. 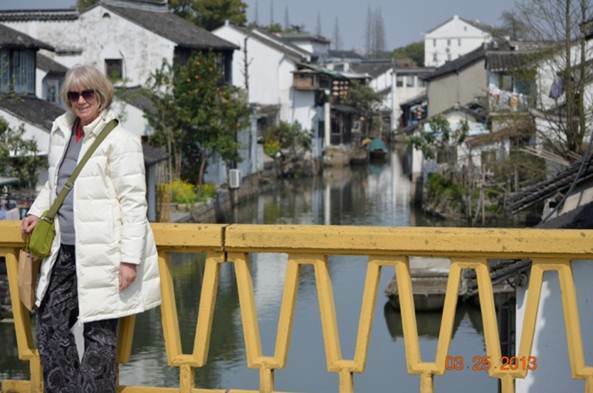 Yesterday we went to Zhujajiao, a water town – there are several water towns that surround Shanghai. We went to one of the closest. Zhuajiao took an hour to get to and is well worth the visit. The bus driver thought he was driving a sports car as they do in China and we changed lanes at high speed with reckless abandon. Zhujajiao is a bit over an hour from downtown Shanghai. 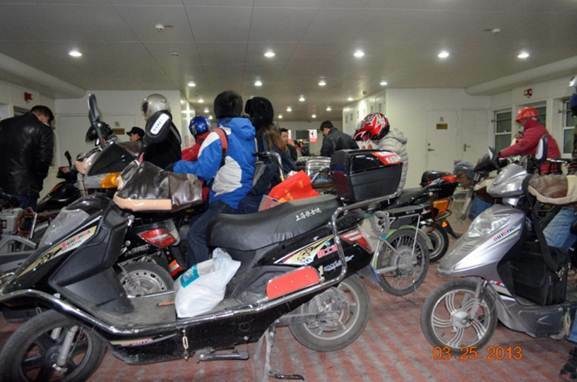 It was only 14 RMB (couple of bucks) for the ride – cheaper than a thrill ride at an amusement park and twice as scary. It is interesting seeing other Westerners who try to place where you are from. We were looking at quilts and this person about my age started speaking to me in German which I do not understand. Narda answered him in German but the guy ignored me and kept talking until I made it clear I did not speak German. Later some people thought they had met us the day before – said they saw Narda at a gem centre – considering we were flying to Shanghai that day and went straight to our apartment how we look like every other Western I am not sure or that I look German. I barely look like me anymore. 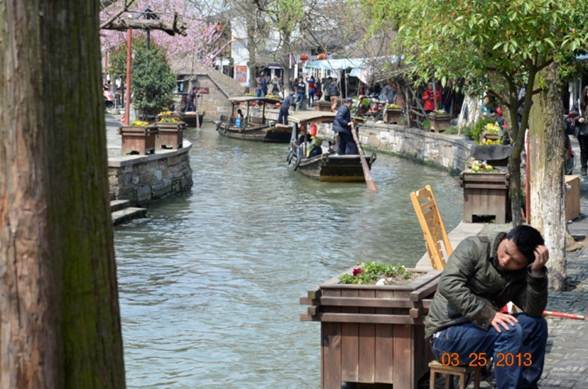 Zhujajiao, located in the Qingpu District of Shanghai, is called the Venice of China but so are a few other water towns such as Zhouzhuang and Suzhou and Tong Li. Zhujajiao was established about 1,700 years ago. There are claims that there are archaeological findings dating back 5,000 years but having left my carbon dating machine home I cannot verify that. 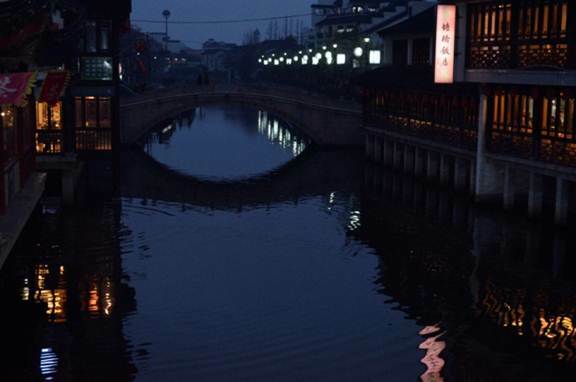 36 stone bridges and numerous rivers line Zhujiajiao, and many ancient buildings still line the riverbanks, several looking like they will collapse at any moment. We did not do the tour of the town at 88 RMB not because of money but because a two and a half hour walking tour with someone learning English seemed difficult. We wandered the town checking out Yuanjin Buddhist Temple, built, they say, ‘originally’, an operative word in post-Mao China, in 1341. OK, so we are the skeptical tourists but so much is so much a replica and even replicas are turning out to be replicas of replicas that we doubt that anything is as it is proclaimed. Nevertheless we enjoyed ourselves and rode one of their boats along one of their rivers. In the midst of Shanghai there is ‘Old Street’, historically called Miaoqian Dajie, which is either a bit of a restored section or a replica of the town from the Ming Dynasty (1368-1644) created for tourist. We have been to Shanghai five times now and this place at least three of those times. 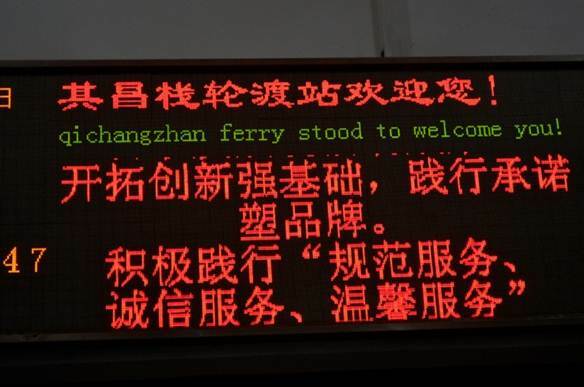 At least it is not referred to as the Venice of China. We even fond an everyday, or three in a row, breakfast place not far from People's Square, getting off at the East Nanjing Road Station and getting out at exit three. Mojos serves a proper Western breakfast so we had toast (though they did not have jam for the toast and by day three we had brought our own jar), eggs over easy, hash browns and coffee. The first day they had loud thumping music and Narda asked them to turn it down so they turned it off making the morning much more pleasant. The other days they had a wide mixture of music from Jimi Hendrix to B. B. King to Dido, obviously the ‘Western tunes mix’. After a couple of years in China we are so over Chinese food. I even eat at KFC, something I never did in the past because in China they have a good corn, carrot some other vegetable mix and mashed potatoes – the only two things they have I will eat and cannot get elsewhere. One thing I do notice about this trip is the lack of being able to get my video clips edited and put on line. I have been lugging my 17 + inch computer with me for years but we thought we would make our trip lighter and just bring an iPad, iPhones and small laptop all of which have no way to edit my many clips into a proper movie. Yes it is good to write and send out stuff sitting on the metro but in those spare moments at our hotel when I would normally be putting together my clips I now just look at hundreds of photos with no way to edit my video. So already I know what I will be doing when I return home on Sunday for a day. I will have at least three youtube clips ready to go before Monday because nothing says it better than a movie. 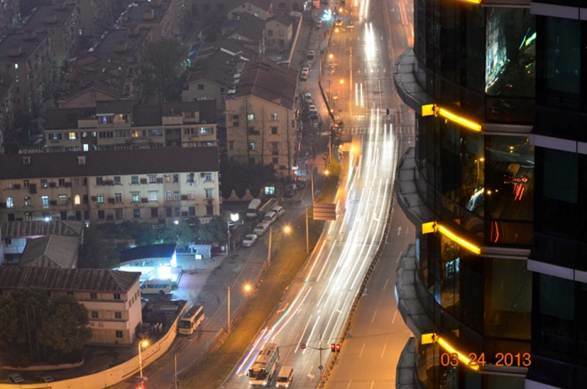 We moved out of our apartment with the great view yesterday after three days and now we are staying at the Metropark Hotel at 159 New Golden Road Pudong. We are in Shanghai to attend the EARCOS (East Asia Region Council of Schools) conference and the Metropark is near the school the conference is at; Concordia International College. The school proclaims on their web site that they are grounded in Christian values, which is something to say in this country of rapidly evolving capitalism; Mao would be shocked, though he would be pleased with the constant destruction of the country to make way for the modern, soon to fall down because they are made from sea-sand, buildings. The hotel looks like a strange concept of a castle though it is really a good hotel and the beds are so comfortable that going to a conference does not seem like we are on holiday which we sort of are as this is our spring break we have given up so we can continually be doing school work.